momentous occasion, set to take place in the city on June 14, 2015. Coventry Transport Museum, with partner Footman James, aims to break the record for the 'Largest Parade of Classic Cars', which currently stands at 1,674 set in Mexico City in 2014. The goal is to attract up to 2,000 classic cars that are at least 30 years old, for the record to be officially ratified by Guinness World Records. 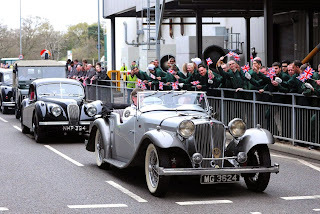 The record attempt is planned for June 14, 2015, the week before the Coventry Transport Museum's official re-opening, and organisers are encouraging classic car owners to get involved by registering to bring their vehicles on the day. The route of the parade, which must measure at least two miles to meet Guinness World Record regulations, will start at the Ricoh Arena and will include the city's famous ring road. To qualify for the parade, each car must be at least 30 years old. Vehicle registration document copies will be required as proof of age. "We are thrilled that Jaguar Land Rover Heritage is supporting us in this attempt to bring this World Record home to Coventry, the spiritual home of the British motor industry. There couldn't be a more fitting way to celebrate the re-launch of Coventry Transport Museum and Jaguar's 80th birthday than to bring classic cars from all over the country, to the city which designed, built and inspired so many gorgeous and pioneering vehicles," said Gary Hall, Chief Executive of Culture Coventry.